Ref: Captains of the Gulf. The configuration of the multi-use cards borrows very heavily from La Granja but falls short of LG’s refinement and balance. CotG has a very heavy slice of randomness and luck. In all plays, one player has suffered when restocks haven’t reflected the licenses they held. Likewise, if you don’t draw a bigger fuel tank, or the creature needed to add a license or fish, you won’t be able to improve in that direction. If the luck falls your way there is no problem, if it breaks the wrong way the game is miserable experience. Using the bonus chits to draw new cards is a step that acknowledges this problem but those points can be used for point generating cool stuff. Yet another slap for bad luck. The rondel is a bit of a procession and the decisions here are pretty obvious. 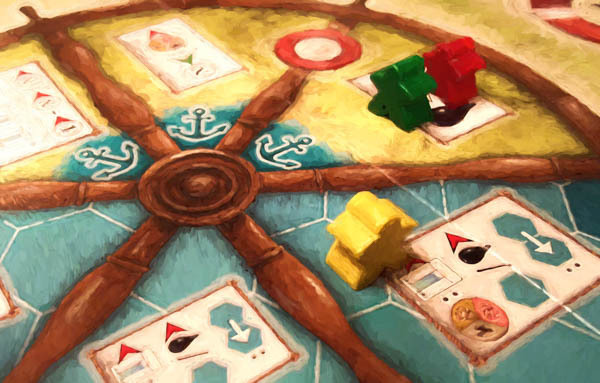 The rondel gives the impression of wide choice but in reality each option flows from the previous turn. In conclusion this is one of the weaker Spielworxx offerings and perhaps indicates a more commercial direction away from the much heavier games like the Coal series and Arkwright.